Ghottab ( قطاب‎ , qottâb) captures the essence of Persian baking. 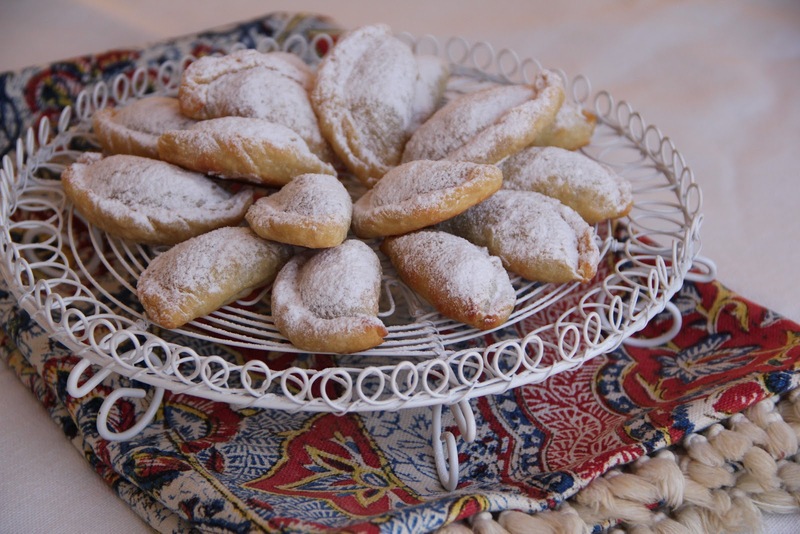 A delectable exotic treat with rosewater, cardamom, walnuts and almonds wrapped in a light pastry and rolled in icing sugar is the queen of all Persian pastries. Ghottab, a souvenir of the city of Yazd, is popular all over Iran and a special treat for Naw Ruz. My uncle Sana's love for ghottab (or perhaps a little obsession) meant that he made numerous trips to the best ghannadi (bakery baking ony sweets) to stock up on this moreish treat. The best ghannadi being in our hometown, we often had him drop by and we knew instantly why he was there! The last time, we shared a batch of ghottab with uncle Sana was in October 2010 and we all knew why we were having ghottab over a cup of tea! It is interesting how foodie stories became so engraved in our minds that it is simply impossible to talk about food without having a little story behind it. I have been through many different recipes to perfect my ghottab making skills. I started off with frying my first batch which turned into an oily fritter, the second batch had almond filling and the result was not quite ghottab, the third lucky batch had more flour in the pastry and 50% more walnuts than almonds. My third batch was the winning formula and my persistence finally paid off. Ghottab is not difficult to make but the key elements are patience and perfection. Below is a recipe for you to try and it will fill your kitchen with a heavenly exotic aroma. Whisk egg yolks, vanilla and sugar in a bowl until well mixed. Add the yoghurt and oil and mix to combine. Add flour and baking powder and mix with a spoon until the dough comes together. Cover with cling film and rest for 2 hours. To make the filling: Mix all dry ingredients in a bowl. Add rosewater gradually until the mix is a sticky mix and can hold it's shape. You may not need all the rosewater. Roll the pastry into 2mm thick and cut with a round pastry cutter. Take a teaspoon size of the nut mix and roll into a ball. Place in the middle of the pastry and fold the pastry over the filling. Brush the edges with little water. Squeeze the pastry and twist the edges. Bake at 160-180C until just cooked. It should not be golden. Sprinkle icing sugar over hot ghottab. جاتون خالی‌ مهناز جان. فکر کنم تا بهار دوباره با ید دست بکار شم. 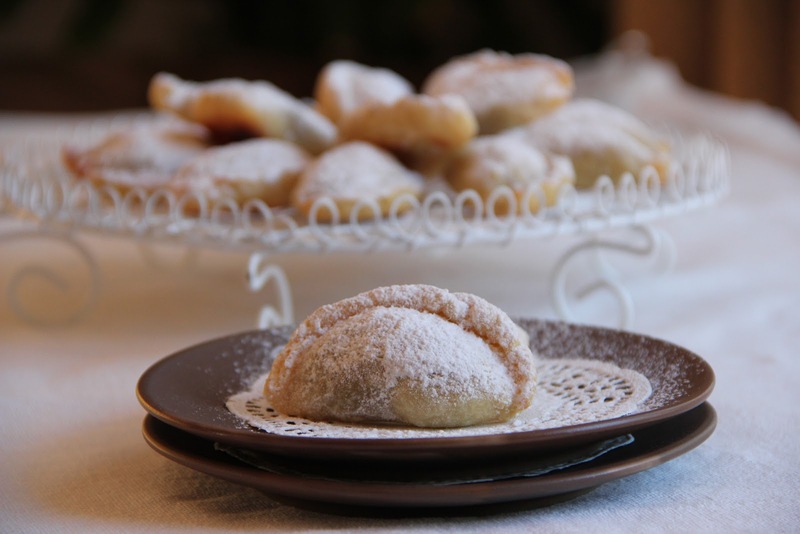 These sweet little morsels sound absolutely divine. Love it. Sorry, I removed your message by accident! I have tried frying these but didn't like them as they turned more like doughnuts. I prefer them baked and they turn out more like bought ones. Thank you!